1. 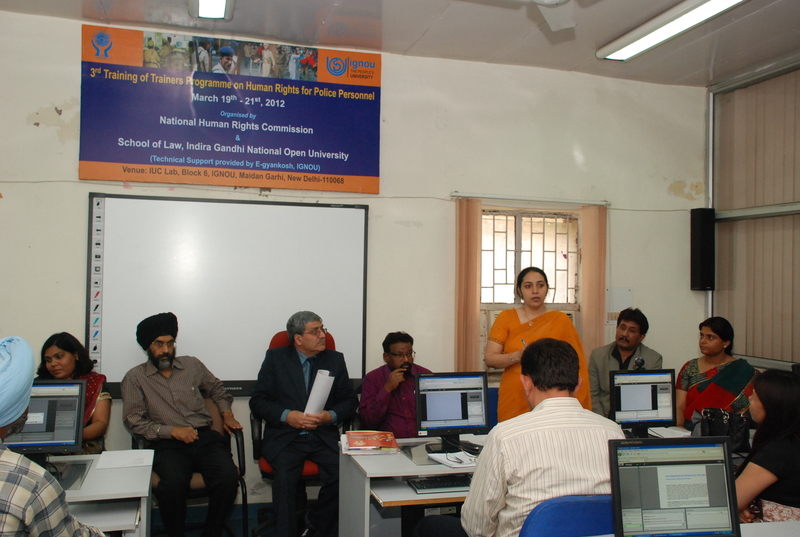 The School of Law in collaboration with NHRC had developed and launched a 5 days online Training Programme for Police Personnel on Human Rights on February 1, 2011 (1-5th February, 2011) at three State Police Academies, HPA, Madhuban UPA, Moradabad and DPA, New Delhi simultaneously. The main aim, purpose and objective of this programme are to sensitize Police Personnel and spread awareness about human rights. 2. 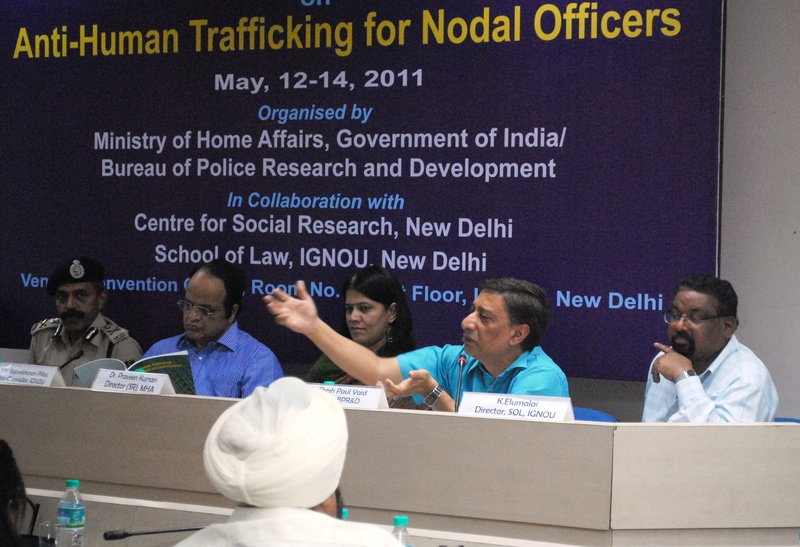 The School, at the instance of the Ministry of Home Affairs/BPR&D and in partnership with Centre for Social Research had organized a three days National Level Workshop of Nodal Officers, Anti Human Trafficking of all State Governments/ UTs from 12-14th May, 2011 at IGNOU. The workshop had deliberated on laws related to human trafficking, investigation techniques and dimensions, magnitude and vulnerabilities relating to human trafficking along with issues relating to rescue, care and rehabilitation. 3. The School organized TOT Programme jointly with NHRC for the Police Personnel in two batches between13-15 June, 2011 and 16-18 June, 2011 (in Hindi and English). 4. 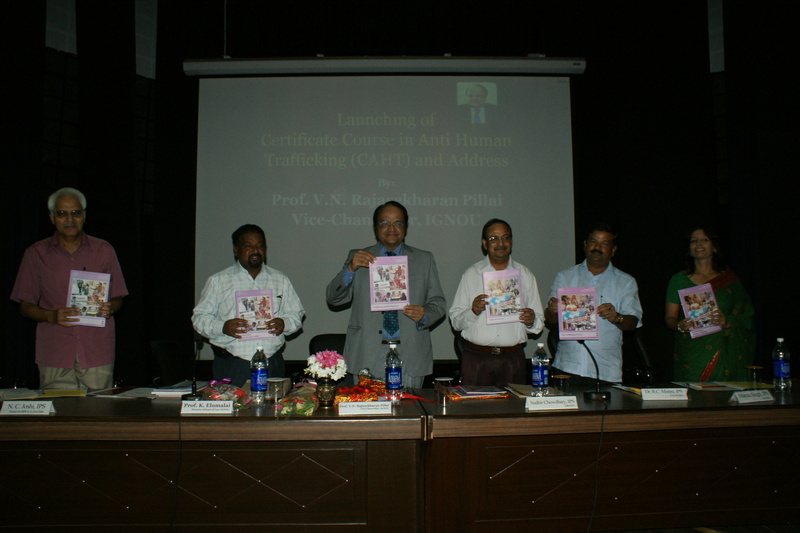 The School of Law in Collaboration with Haryana Police Academy (HPA) Madhuban has launched the Certificate Course in Anti Human Trafficking for the State of Haryana on 3rd August, 2011 at HPA, Madhuban. 5. 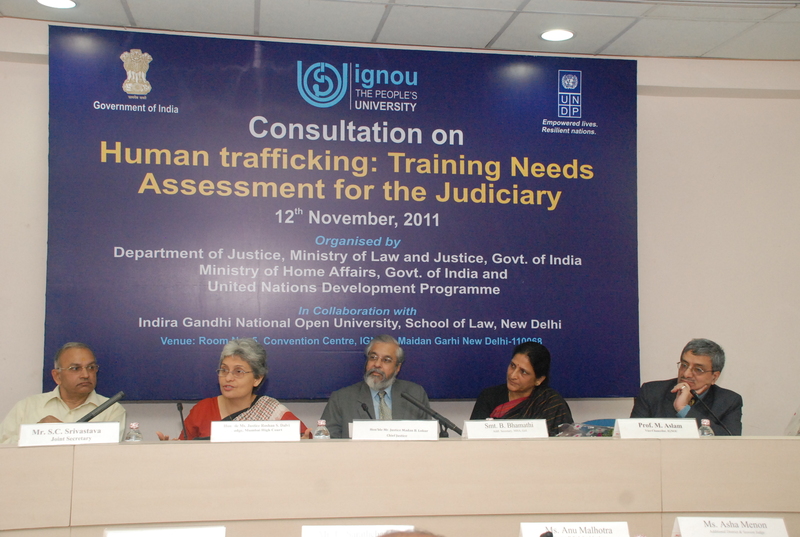 The School, at the instance of Department of Justice (DoJ), Ministry of Law and Justice and United Nations Development Programme (UNDP) organized a one day consultation on “Human Trafficking: Training Needs Assessment for the Judiciary” on 12th November, 2011 at IGNOU in collaboration with the Ministry of Home Affairs (MHA) Government of India with the objective of developing a training module for judges dealing with human trafficking. 6. 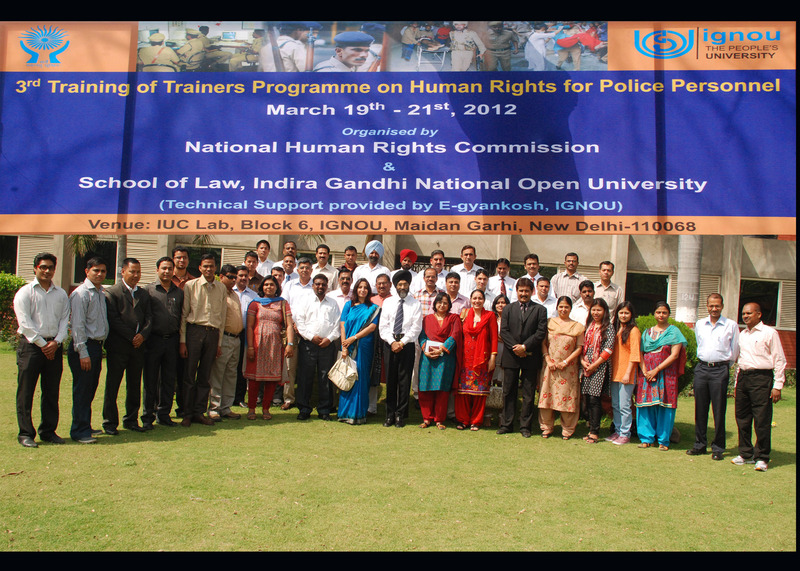 A 3 days ToT programme on Human Rights for police personnel was organised by SOL, IGNOU in collaboration with NHRC from March 19-21, 2012. This Programme was participated by Senior police officials from 27 States/ UTs. 1. School of Law, IGNOU has started a series called “Kanooni Salah” in Gyan Vani Radio channel on 2nd and 4th Wednesday of every month between 5-6 p.m since, w.e.f June, 2011 primarily with a view to create awareness among masses on laws and issues pertaining to Women, Children, Physically Handicapped Persons, Senior Citizens and SC/ST etc. This programme has received wider participation and appreciation. 2. School of Law has also launched on 26th January, 2012 a live interactive phone in programme on ‘Legal Awareness for Common People’ though G.D.1. This live and interactive phone in programme in Gyan Darshan 1 is being held between 4-5 pm on 1st and 3rd Saturday of every month.